S. Tamer Cavusgil serves as executive director and principal investigator of GSU-CIBER. He holds the Fuller B. Callaway Professorial Chair in the Robinson College of Business. Tamer is a world-renowned educator, scholar, mentor, journal editor, institution builder, leader of professional societies, and an advisor to senior executives and international agencies. Over the years, he has served as principal investigator on numerous federal projects, including Title VI grants (CIBER, BIE, UISFL). Tamer’s career spans three decades of teaching, mentoring, research and administrative leadership. His scholarship on internationalizing firms, exporting, global strategy and multinationality has placed him among the top four most prolific international business authors. He is one of a handful of scholars who have authored more than a dozen articles in the Journal of International Business Studies. Tamer is an elected fellow and a past vice president of the Academy of International Business. In 1995, NASBITE named him the inaugural International Trade Educator of the Year. 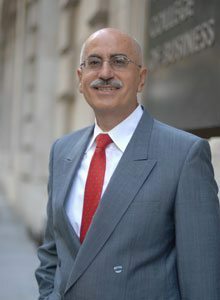 Tamer is a past elected president of AIBER (the Association of International Business Education and Research) and Gianni and Joan Montezemolo Visiting Chair at the University of Cambridge; in addition, he currently serves as a visiting professor at Manchester Business School, U.K. Author or co-author of more than 200 refereed journal articles, Tamer is also the senior author of the leading text International Business: Strategy, Management, and the New Realities, published by Pearson Education. Recently,Professor Tamer Cavusgil was awarded an Honorary Doctorate from The University of Southern Denmark (SDU) for his many contributions in international business. This is Tamer’s second honorary doctorate, the first being from Hasselt University in Belgium. Tamer was honored at a university-wide celebration on October 27, 2017 in Odense, Denmark.